These Heroes Need a Chance to be Super! Iron Man 3 officially opens summer blockbuster season this weekend, and let’s be honest, until Robert Downey Jr. put on that flat, noseless mask, no one gave a two poops about Iron Man. But now, he’ll probably rake in more dough than Superman. That’s what the Hollywood treatment can do for a fledgling superhero, which is why we are campaigning for a few other second-tier heroes that could use a little limelight. All they want is what they have coming to them. All they want is their fair share. 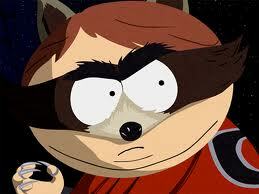 Why no movie for Eric Cartman’s masked, tailed vigilante from South Park? It’s a perfect set up: a super hero, a rival (Kenny’s mysterious Mysterion), and an arch nemesis (Butters’s alter ego,Professor Chaos and his little buddy General Disarray). Plus, between Coonacon and the product placement opportunity for Chipotlaway, it pays for itself. What more does Hollywood need? What is everyone looking at? Nothing, but it’s time that changed! Superheroes like Ace and Gary have been ignored and forced into hiding for too long. Who cares that they’re late night TV superheroes? They deserve the same opportunity to fight crime as all the other tightly-panted hero buddies. It’s time they left the shadows and headed for the spotlight. Come on out, Ace and Gary! Sure, he has his own band, but Milhouse Van Houton’s overshadowed super sidekick needs to step out from behind Radioactive Man’s cape and save the day on the big screen. Yes, his mask stinks of acne medicine and desperation, but c’mon, can’t Hollywood borrow a feeling and give him a chance! Those flowing locks, those bulging, furry biceps. Oh mighty Lion-o, how can it be that you have not yet graced the silver screen? Can we blame evil Mum-ra, ThunderCat foe? Or just the small minded Hollywood big wigs who can’t see how hard it is to lead fellow Thundarians and still maintain that coiffure? Best of 2017 So Far!